Science can sometimes take Alaska-based researchers on adventures to distant lands. And a project bringing together data from the Arctic and Antarctic recently sent two University of Alaska space physics students all the way from Fairbanks to the South Pole. Kylee Branning and John Elliott made the trek to service an all-sky viewing interferometer, an instrument that measures the “optical Doppler shift of airglow emissions.” Elliott and Branning say that is essentially a way to look at the “winds” of space. And while space weather is interesting on its own, the first part of their conversation with Alaska Public Media’s Casey Grove was, of course, the regular weather 11,000 miles away from home at the South Pole. Elliott: Looks good right now. Yeah, it’s, we had a large storm yesterday, but it’s cleared up now. Elliott: More reasonable temperature, I think like -4 F. We came within about 1 degree of setting the all-time highest ever recorded temperature yesterday. We made it up to 9 F. Yeah. Grove: Well tell me what did it take to get there? You guys are based in Fairbanks, right? Branning: Yeah, so from Fairbanks we have to fly to Seattle, which is four hours, and to San Francisco, which is three hours, I think. And then from there we go to Auckland, New Zealand, which is 13 hours and then off to we go to Christchurch, which is an hour and a half about. Then from Christchurch and it takes about eight hours to get to McMurdo. Then the next day you’ll get on another plane. 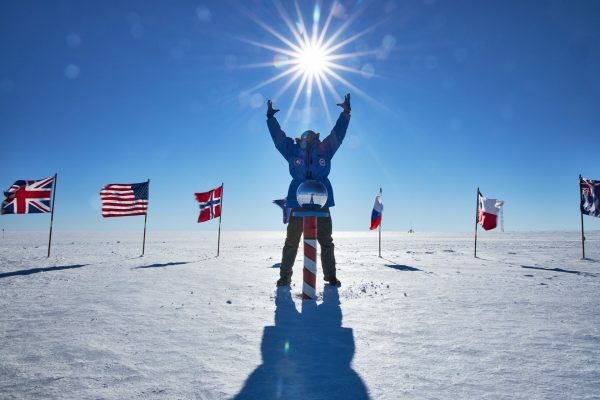 It’s about three hours to get this South Pole. However for us the Christchurch to McMurdo part took about 29 hours? Branning: And it’s extremely hard to predict the weather eight hours before your landing because McMurdo weather is Antarctic weather, which changes a lot. Elliott: And what ended up happening was we went as far as we could go, we made it right up to 10 minutes before we had to turn around or he would not have enough fuel, and two times they made the call that it was not safe to continue to go to McMurdo. So we turned around and it ended up taking us 29 hours of flying in a C-130 Herc to get to Murdo. Overall to get to the South Pole, we’ve flown a little over 50 hours in the air. Grove: So we could talk about penguins for a while, I’m sure, but what are you guys actually doing down there and what sort of research are you supporting? Elliott: So the work that we’re doing is for Professor Mark Conde, and we work both in polar regions, but obviously the work we’re doing down here is in support of just the Antarctic region. We have two instruments that are looking up at the sky. And we’re measuring the wind speed really high in the air. Something called space weather. We’re measuring the winds for this weather, about 25 times higher than an airplane flies, and that that instrument is a very precise optical instrument and we put it in one of the most inhospitable places on Earth. And so what ends up happening is the instrument will come out of alignment. It will come out of tune. Simple things like motors that need to move will start to break down and we don’t have enough of an internet connection to send our data back. So we actually have to physically come down and grab our data. Grove: What’s the most interesting thing or the wildest thing that you’ve seen either on the journey or just being there at the South Pole? Branning: John really likes the giant snowblower they have here at the South Pole. Elliott: It blows snow about 80 feet in the air. Yeah, it’s it’s remarkable. Branning: And they have to do that because there’s actually the snow is crushing the old station. It’s actually caving in. Elliott: Some of the South Pole station is underground. Branning: Yeah, and then also underground they have a tunnel system with shrines, which are interesting to see. So, one of them’s the last bucket of ice cream 2012. Elliott: You know for me, it’s just the sheer magnitude of it, you know. Elliott: Yeah, we’re in a place that is so inhospitable to life, not just human, to life, and yet here we are. You know, all we have to do is take a few planes, you know, wear a little cold weather gear and the (National Science Foundation) has just got this massive instrument that just, it’s just like an unstoppable force to do do nothing, but science. Branning: And also something so new because the first and Antarctic travel was like what, a hundred years ago? Elliott: Yeah. The pole just … over a hundred years ago. Branning: It was the first first visit to the pole. So it’s really a new experience for humans. Elliott: You know, it’s really humbling experience that, it just it impresses on you so much when you first get off that plane, you’re getting off this cargo netting kind of seat, you walk out of the plane, the propellers are running, you look over and there it, you know, the South Pole station, you’re standing on top of two miles of ice. You’re in the most extreme part of Earth that can exist, and you’re their only to do science. Elliott: It’s a great feeling. It’s really cool.